For the human practices portion of our project, we wanted to continue the work of previous University of Virginia teams, while also pursuing a project unique to our current group. In other words, we wanted to do a lot this year. We decided to organize all of these projects into a multi-tiered system where the different tiers focused on the local, regional and international communities. Locally, we organized a Synthetic Biology Night at the University of Virginia, which was open to students from the University as well as locals interested in science and synthetic biology. Regionally, we continued to partner with Renaissance High School in downtown Charlottesville and began a new partnership with a public school in Albemarle County. 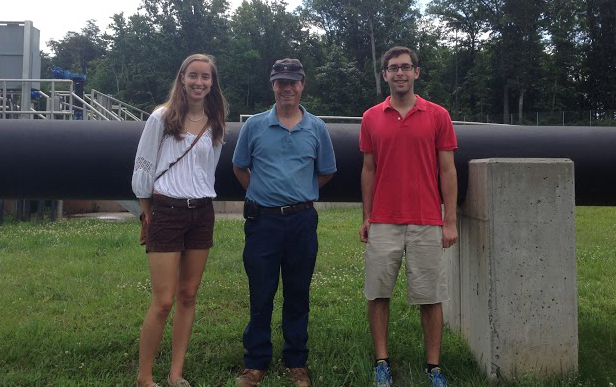 We also met with Lynn Clements, the director of projects for the Rapidan Service Authority, to tour a regional wastewater treatment plant and discuss the need for and feasibility of our project’s implementation in wastewater treatment systems. 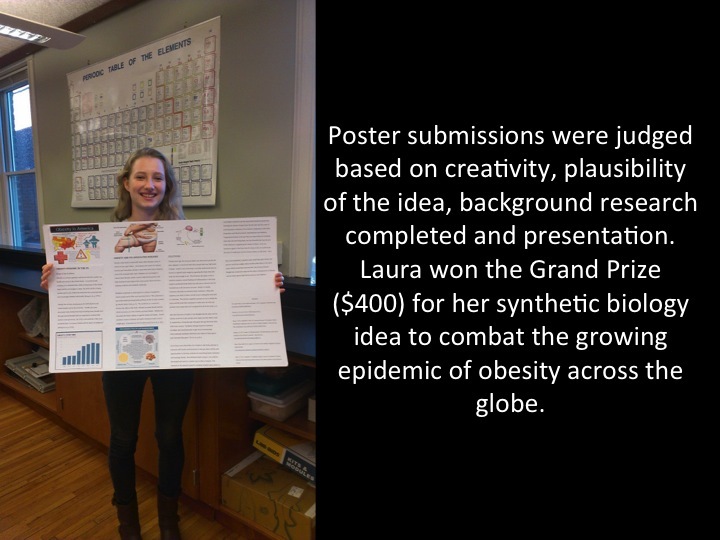 Globally, we created a Synthetic Biology Awareness and Acceptance survey and asked iGEM teams to distribute it in their communities across the world. 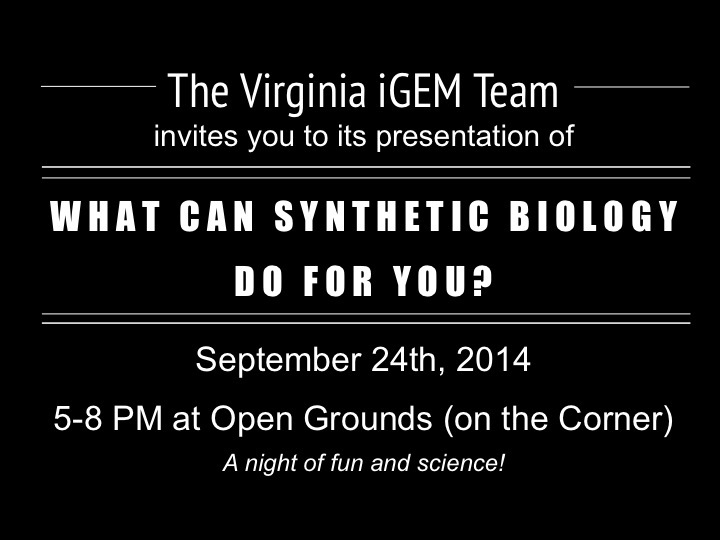 Locally, we organized a Synthetic Biology Night at the University of Virginia, which was open to students from the University as well as locals interested in science and synthetic biology. 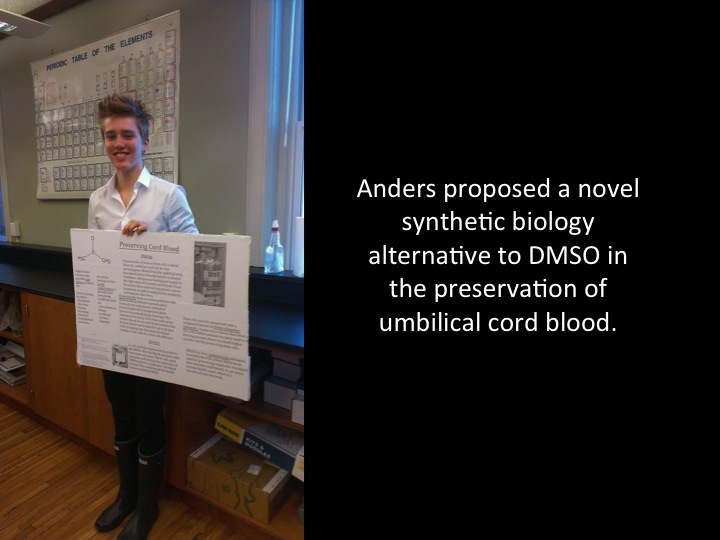 Panelists from the University of Virginia community discussed the ethical implications of our growing field of synthetic biology, and student posters describing potential synthetic biology projects were displayed. Regionally, we continued to partner with Renaissance High School in downtown Charlottesville and began a new partnership with a public school in Albemarle County. 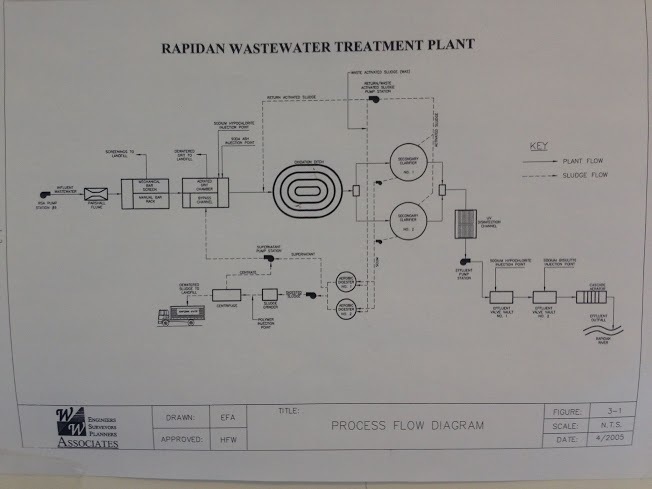 We also met with Lynn Clements, the director of projects for the Rapidan Service Authority, to tour a regional wastewater treatment plant and discuss the need and feasibility of our project’s implementation in wastewater treatment systems. 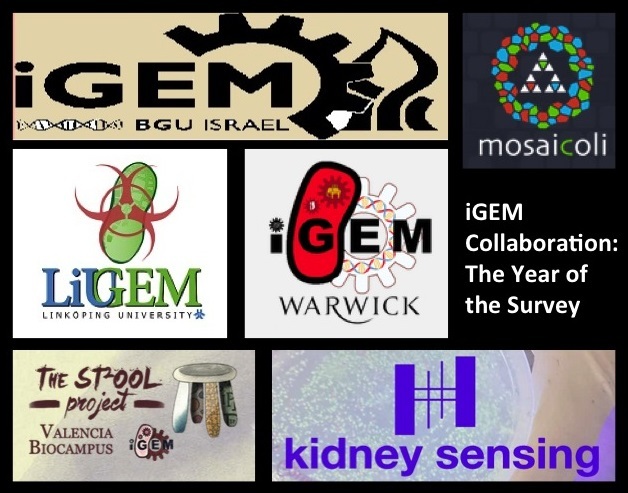 Globally, we created a Synthetic Biology Awareness and Acceptance survey and asked iGEM teams to distribute it in their communities across the world. The results from this survey will help to shape policy and education on synthetic biology on a global scale. When giving out the survey, we handed out a pamphlet with information about our team and our project. We also provided a link so that people could leave feedback about our project, or bring up any concerns they may have. 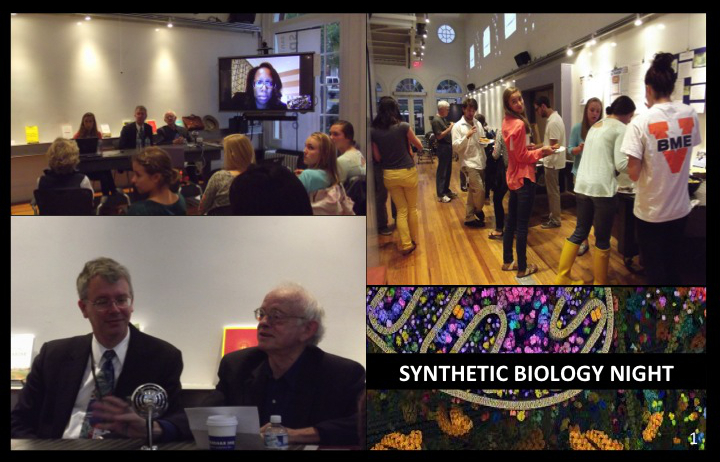 In order to engage the local Charlottesville community and to extend our teaching out of the classroom and towards the general public, we hosted a Synthetic Biology Night on September 24th at OpenGrounds. The OpenGrounds Corner Studio aims to connect institution with community, and this environment contributed to our collaboration which targeted both students from the University of Virginia as well as locals interested in science and synthetic biology. The event opened with a discussion of the ethical issues related to synthetic biology by three field experts, with the goal of informing the public and allaying any misconceptions about the topic. Dr. Kozminski, a molecular cell biologist, provided scientific background on the field of synthetic biology and brought a scientific perspective to the discussion. Dr. Arras, a professor in the bioethics department and member of President Obama’s Presidential Commission for the Study of Bioethical Issues, provided insight on ethical and religious groups’ perceptions of synthetic biology. Professor Bagley of the UVA Law School, shed some light on the legal side of synthetic biology research, especially issues concerning the patenting of genes modified or created using synthetic biology methods. Check out our event program to learn more about the panelists. Panelists discussed a range of topics from the environmental release of bacteria to the proper regulation of synthetic biology research. The conversation also touched on issues such as the labeling of synthetically produced products and the growth of DIY biology. The first portion of the dialogue was moderated by a member of our team, but the audience was encouraged to join in the dialogue and provide questions for the second portion of the panel. A reception followed the panel discussion, and attendees had a chance to chat with the panelists one on one, and to view posters submitted by local high schoolers (see below). 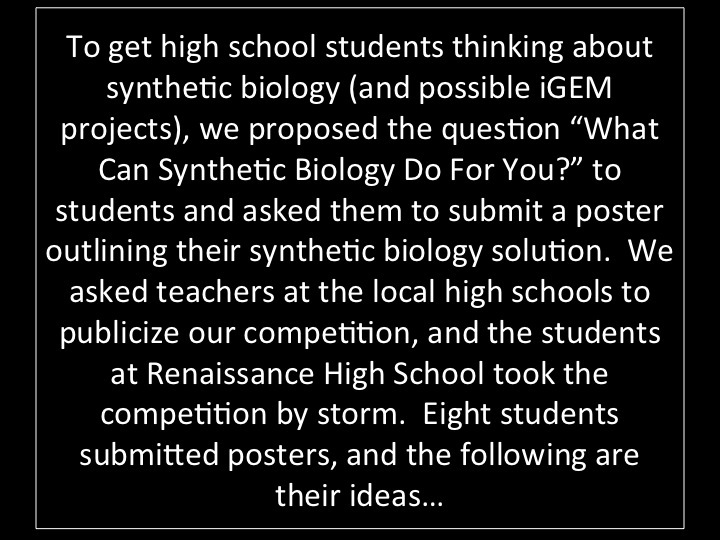 Last year, the 2013 VGEM team reached out to Renaissance School and offered to teach a class on synthetic biology and the iGEM experience. Renaissance accepted, and the VGEM team visited the school once a week for six weeks during the fall. 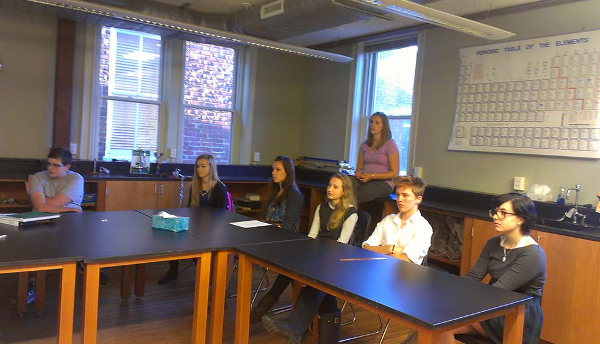 This pilot class has now become a regularly offered course at Renaissance School, and students taught by the 2014 VGEM competed at the 2014 High School iGEM competition. The work of the 2013 team inspired this year’s team to continue and expand their collaborative efforts with other schools in the community. 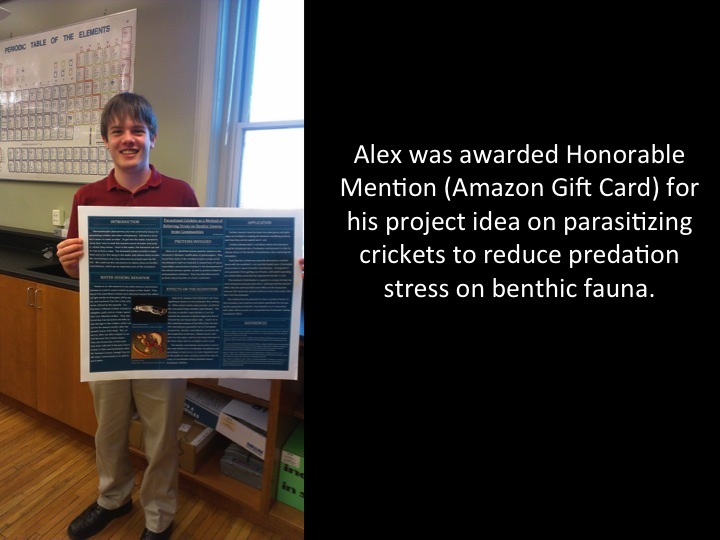 We began the summer by reaching out to specialized science programs at public high schools in Albemarle County. We met with Jeff Prillaman, the director of the MESA program, to discuss teaching a synthetic biology crash course similar to our predecessors with his students. 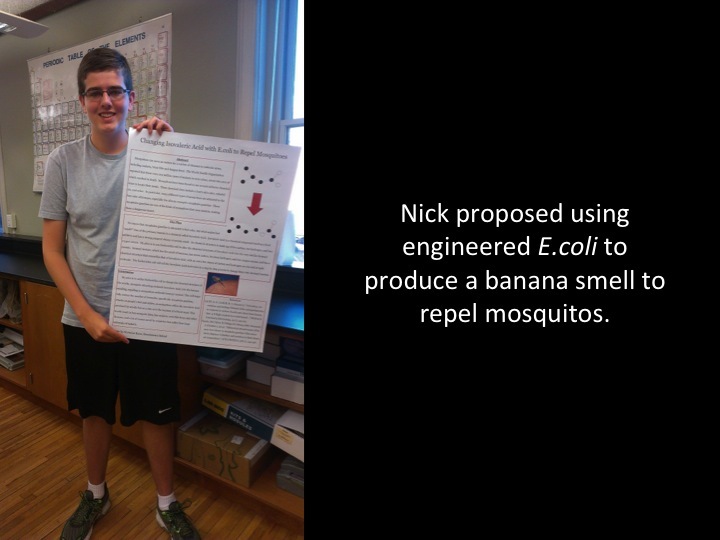 He accepted our offer, and we spent the summer preparing a three-day synthetic biology crash course to be presented to students in the program. Team members taught the synthetic biology course over the week of September 8th. 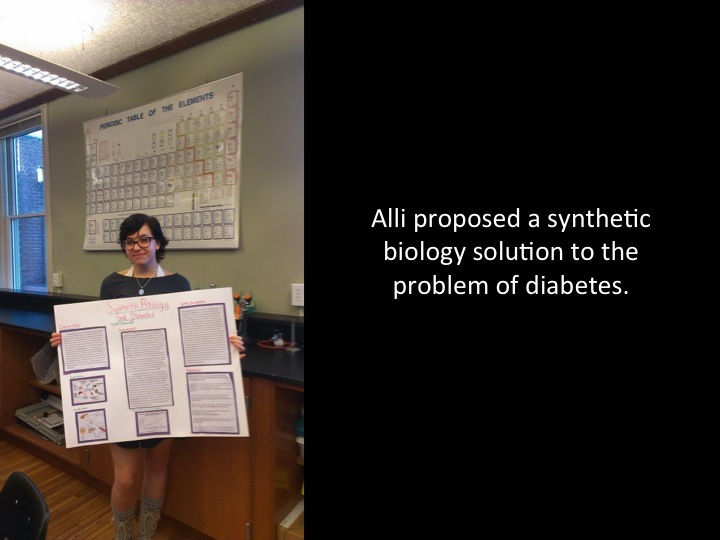 The first class consisted of a general overview of basic molecular biology and an introduction to the field of synthetic biology; this curriculum was taught to both juniors (60) and seniors (40) in the MESA program. The second class focused on BioBrick formation and lab work. Seniors completed a restriction enzyme digest worksheet, loaded, ran and visualized a gel and transformed and plated bacteria containing plasmids with an RFP construct. 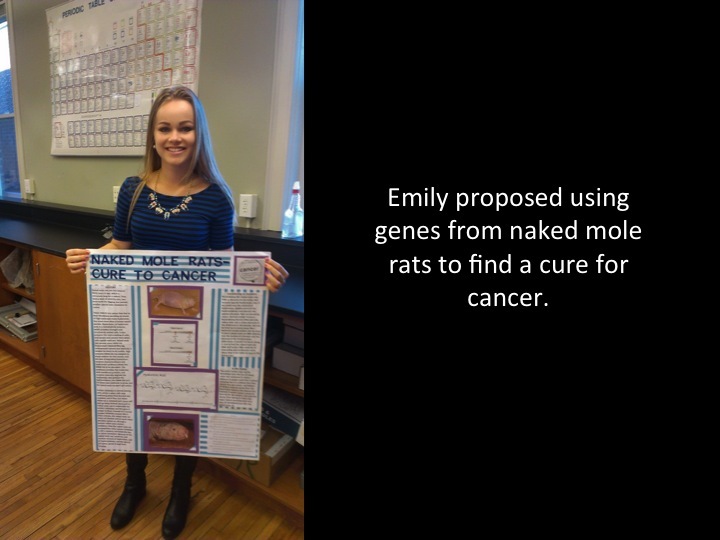 The third class was split into two mini-lectures on the modeling used in synthetic biology and a discussion of the ethics involved in synthetic biology research. The students were given pre and post-assessments for this crash course. Figure 1. Average points obtained on each question was compared using data from 25 students on pre and post assessments. Figure 1 illustrates an overall improvement in student performance after the three-day course. From Figure 2, we can see that the topic that showed the most improvement was restriction enzymes with a 40% difference between pre and post assessments. Questions on gel electrophoresis also improved with a 33% difference on diagram identification and 32% difference on identification of the laboratory process. Questions on transformation improved with a 25% difference between pre and post. The improvement on these three question topics corresponds to activities done with students on day two of the course, namely the gel electrophoresis and the transformation of a plasmid into E.coli. Questions that covered topics only reviewed in the lectures showed the least improvement, such as recombinant DNA (6.7% difference) and polymerase chain reaction (2.7% difference). To improve understanding of these topics in a future course, interactive activities will be designed for these topics. Figure 2. Percentage difference between pre and post assessment scores on each question of the assessment. 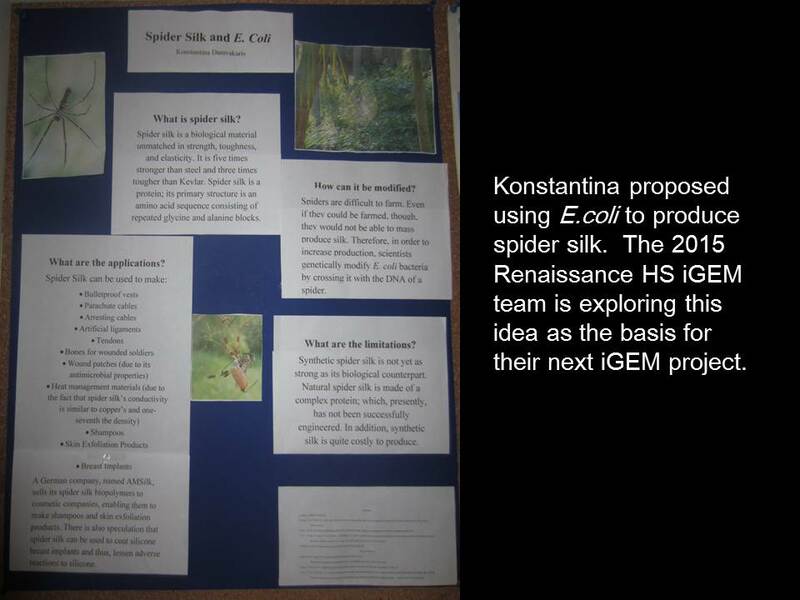 On October 8, 2014, we visited Renaissance School to give them feedback on their 2014 iGEM project and advise on their new project for the 2015 High School iGEM competition. 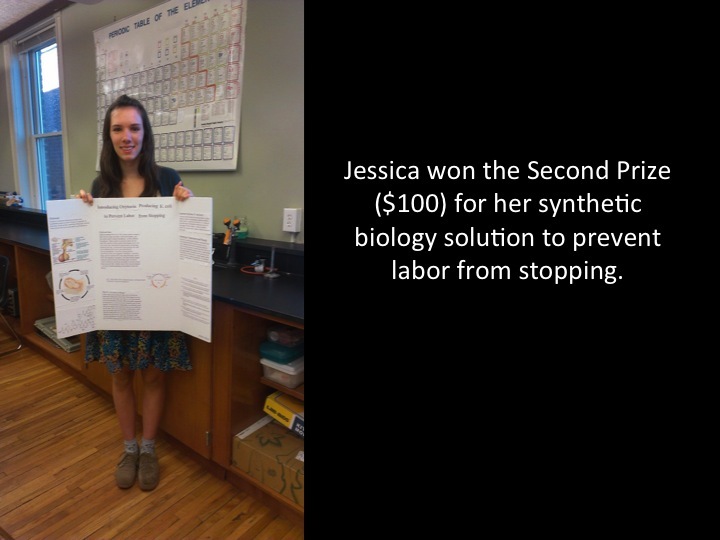 We also presented students with awards from the What Can Synthetic Biology Do For You? competition. Resources From "Synthetic Biology Crash Course"
To see if our bacterial biofilter would be a viable solution to the issue of environmental microplastics, we met with Lynn Clements, the director of projects for the Rapidan Service Authority, at the Ruckersville wastewater treatment plant. The water coming into the plant goes through five stages of treatment before it is released into the environment. Larger solids as well as sand and grit are filtered out of the water using grated filters. However, these filters can only remove particles that are ½” or 12.7 mm in diameter. Microplastics are defined as plastic particles that are 5 mm in diameter or less and are clearly not being removed from the water supply using these filtration methods. We felt that directly after this filtration step would be the best place to implement our biofilter. The water then goes to an oxidation ditch, where natural gut bacteria remove the remaining organic matter from the water. 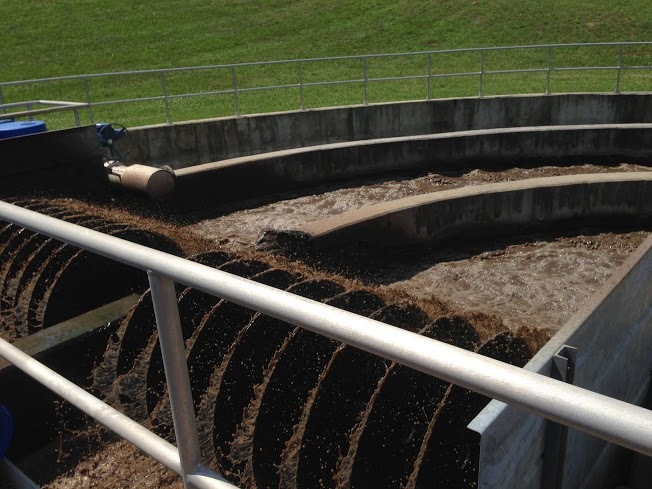 After the oxidation ditch, the water moves to the clarifier, which allows remaining solids to settle out of the water and be removed as sludge. The water finally moves through a UV disinfection chamber to remove any bacteria from the previous treatment steps. We were particularly interested in this final step of treatment as it meant that any bacteria we added upstream of this step would be removed by the UV disinfection. Therefore, we felt that our biofilter design would not pose any additional safety threat to the water treatment plant. The water is then directly released into the Rapidan River, located about 5 miles away from the plant. After touring the plant and talking with Mr. Clements, we felt that our biofilter was a viable solution to the microplastics problem. We also now knew where best to implement the filter and had gathered parameters for a model-based assessment of our bacteria’s nylon degrading abilities in the plant. As part of our global human practices initiative, we created a survey to gauge knowledge of and sentiment towards synthetic biology. Here's a copy of the survey. We sent this out to every iGEM team, asking them to collect at least 20 responses from the public in exchange for a webbadge. Fifty-five teams participated, and twenty-one collected 20 results or more. All living things have genes. Genes determine how these living things, also known as organisms, look, what they do, and how they function. In synthetic biology, genes can be taken from one type of organism and put into another. This allows the modified organism to exhibit traits that it would not exhibit in nature. For instance, by putting a gene from a firefly into bacteria, you can make the bacteria glow. 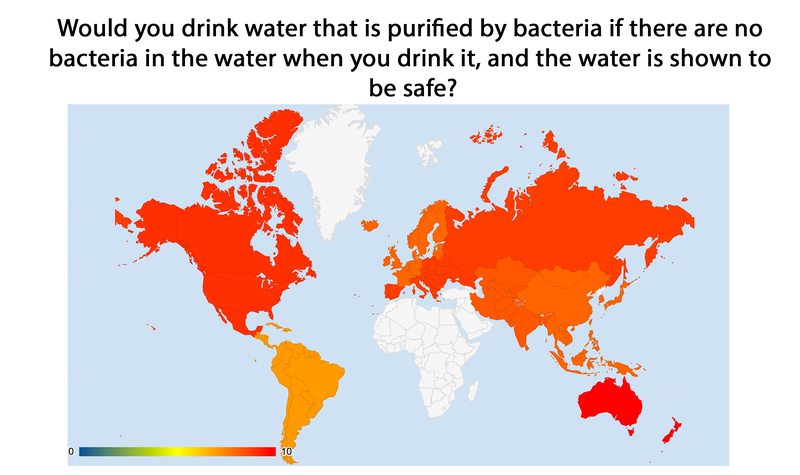 Would you drink water that is purified by bacteria if there are no bacteria in the water when you drink it, and the water is shown to be safe? They were able to select either ‘yes’ or ‘no’ as responses. This map displays the percentage of ‘yes’ responses, leaving out either blank or ‘no’ responses. The maximum value is 10, and the minimum value is 0. 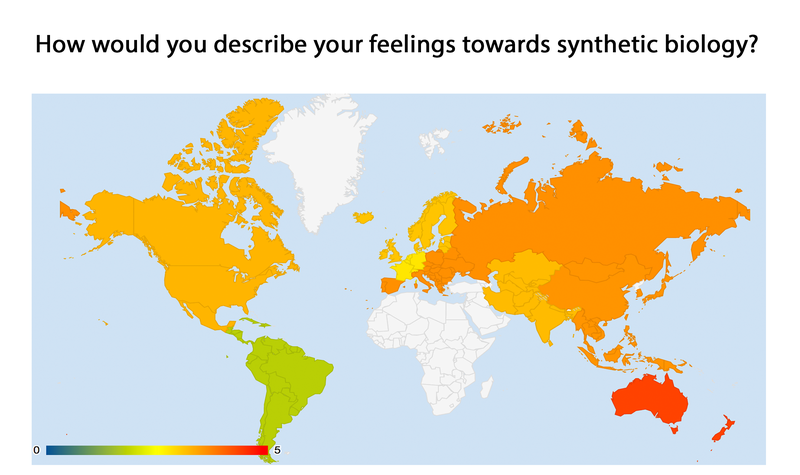 Comparing these maps shows a possible discrepancy between feelings towards synthetic biology in the abstract and applications of synthetic biology. Feelings toward synthetic biology appear to be, on average, neutral, but, for every region, at least 50% of participants responded that they would drink water cleaned through synthetic biological means, provided assured safety. This shows promise that, with increased awareness of potential applications for synthetic biology, views may improve. Figure 1. 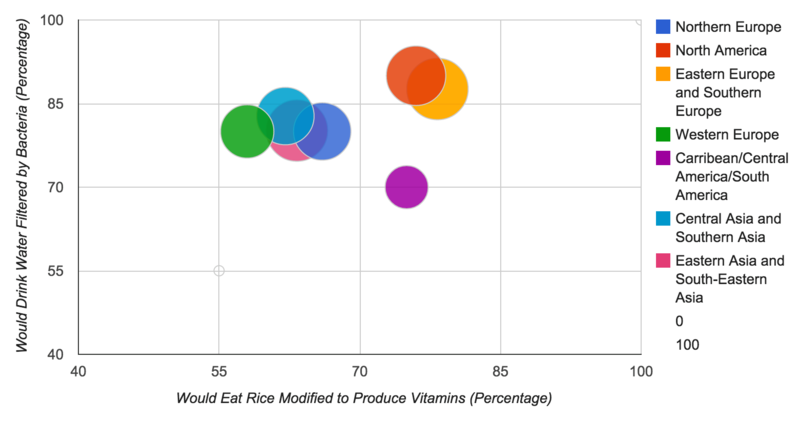 Comparison of percentage of people who would eat rice genetically modified to produce vitamins and percentage of people who would drink water filtered by bacteria if assured there were no bacteria in the water at the time of consumption. Bubbles are sized by general opinion towards synthetic biology (based on a Likert scale from ‘strongly negative’ to ‘strongly positive’). 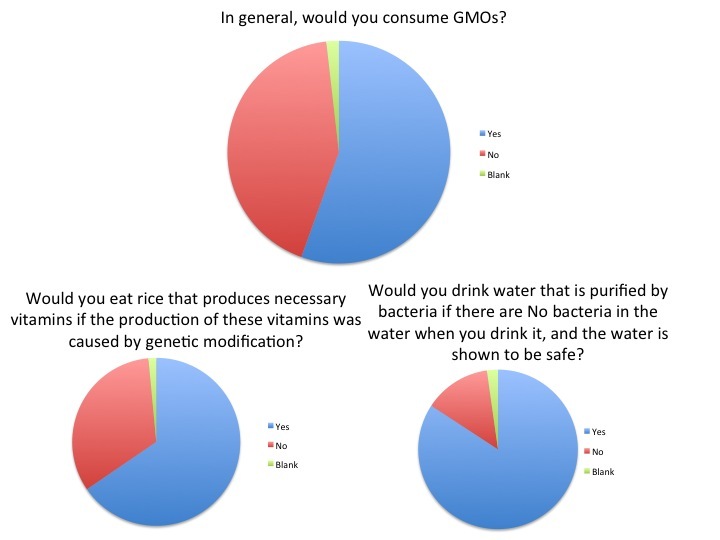 There seems to be a slight positive correlation between willingness to eat GMO rice and drink bacterially purified water. However, in all regions, more participants were willing to drink the bacterially purified water than eat the modified rice. There does not seem to be any relations between feelings towards synthetic biology (shown by the size of the bubbles, larger being more positive feelings) and willingness to consume either the rice or the water. 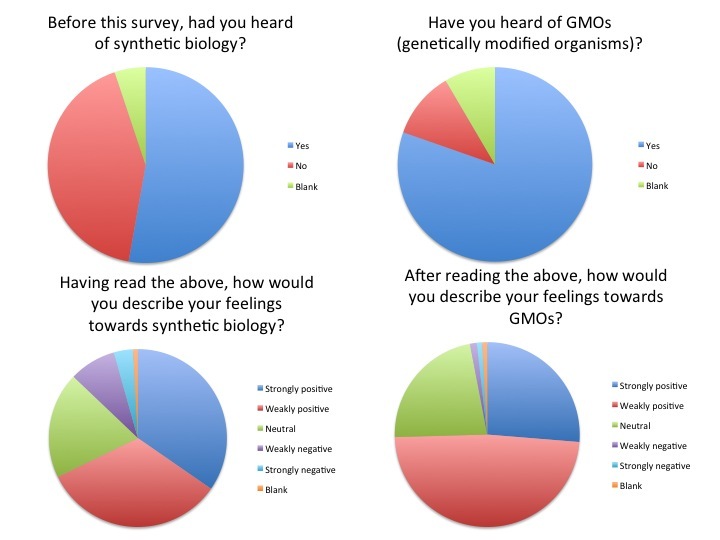 In general, the public had positive feelings towards synthetic biology and genetic modification. Throughout the survey, we placed questions to see if semantics affected the public’s perception of topics. When asked if they would consume GMOs, there were many responses for both ‘yes’ and ‘no.’ However, when asked about eating specific genetically modified organisms without the term ‘GMO,’ many more said ‘yes’ than the initial responses would have suggested. 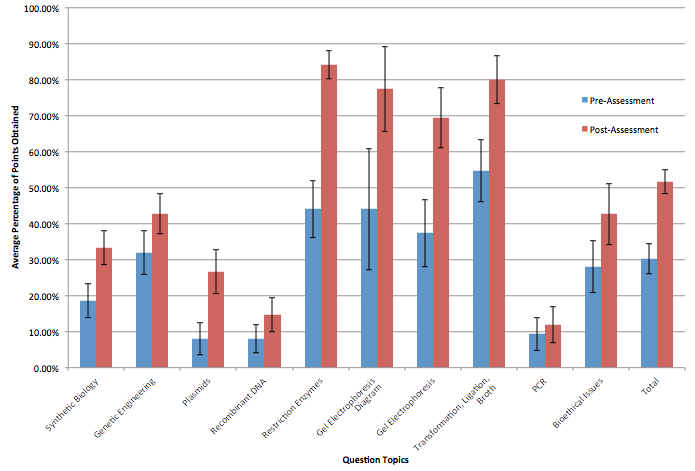 This shows that modified wording affects feelings towards a topic, and suggests that people may be more supportive of something like GMOs provided specific examples. We also included a small series of questions to judge potential public perception of our project. These questions were those that involved the filtration of water by bacteria. 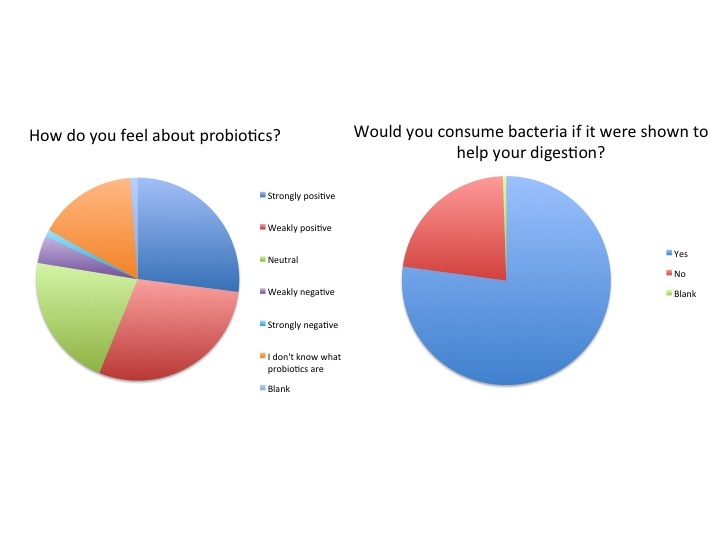 Overall, a majority of people had positive feelings towards this: they felt that the benefits outweighed the risks; they would drink water that was filtered by bacteria; and they would have positive reactions if they were to learn that it were currently occuring. 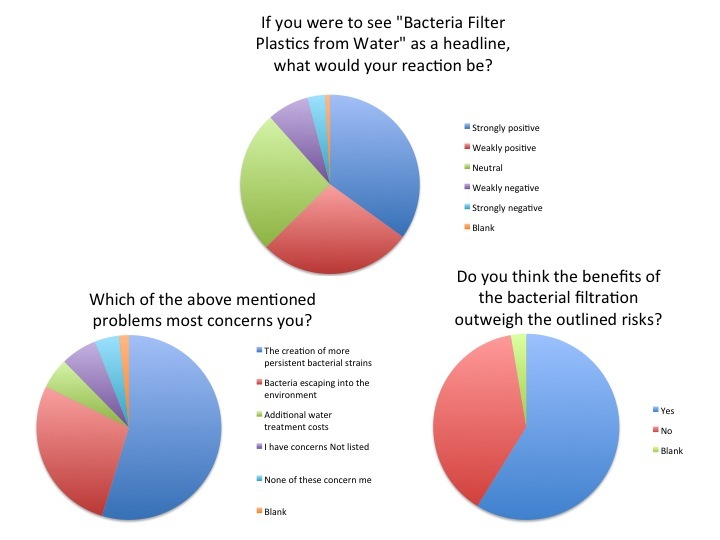 We also asked about concerns regarding bacterial filtration. These responses provide us with valuable insight as to which potential problems with which we should be most concerned about addressing. Want to know what your region thinks about synthetic biology? Then, look no further! 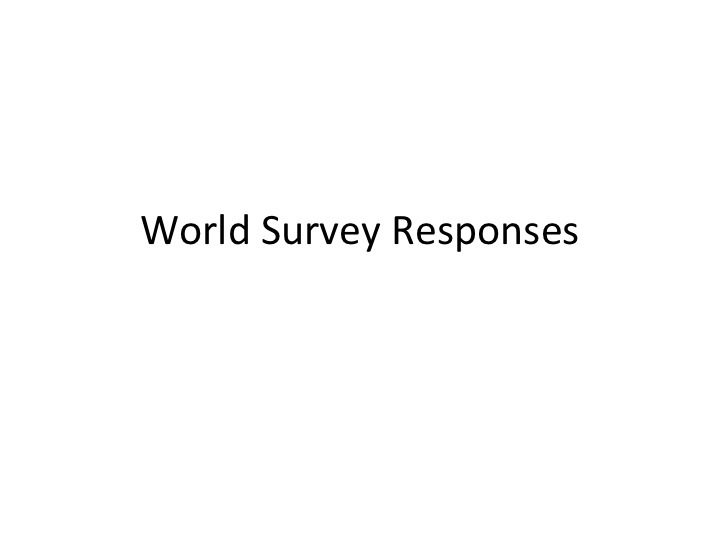 Below are the survey results; they are organized by region, and, under each region, there are pie charts that represent each question on our survey. Enjoy! Thanks to the following teams who have completed the requirements for the collaborative survey web-badge! And a special thanks to those teams that translated the survey! 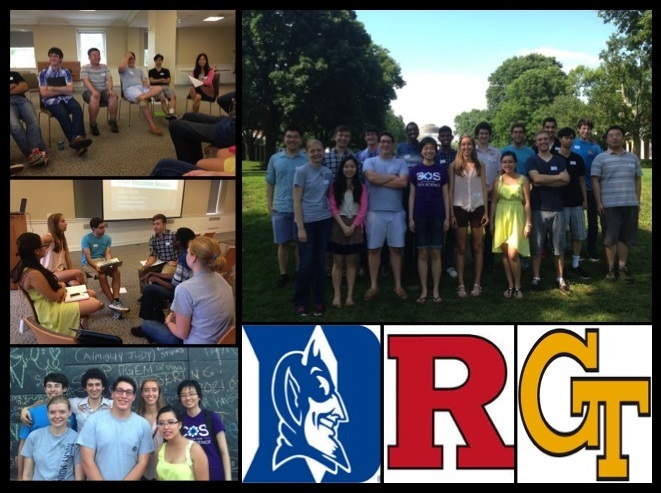 On Friday June 27th, we hosted our first meet-up for iGEM teams in the surrounding area. Members of the Rutgers, Duke and Georgia Tech teams came out to the meet up. We began with short presentations by each team of their projects for the summer. Teams then split into specialized discussion groups; these groups discussed topics such as the iGEM lab experience, human practices and community outreach, and finance. We ended the main portion of the event with a discussion of team collaboration. Some team members then joined us for dinner on the Corner and a night on the Downtown Mall.